Those that complete the entire program are commissioned for Christian service in the semester before they graduate. Here is a brief introduction to the students of the 2014 commissioning class. Nicole is a deeply formed Roman Catholic student that has spent much of her college life with the evangelical women of the ministry of Cru (formerly known as Campus Crusade). This unique formation means that Nicole has a stability and passion that are rarely coupled together in young adults. After she traveled with the chaplains to Sierra Leone, West Africa, in 2012, she committed to working for the health of that nation. Nicole rode her bike 3700 miles from Savannah, Georgia, to Vancouver, B.C. to raise over $4,000 to build homes in Sierra Leone through the Fuller Center. And this year, she will do a large part of the trip again to raise more money. The most remarkable thing about Nicole is the remarkable joy with which she lives her life. Her life has been transformed by relationship with Jesus such that you will rarely see Nicole without a smile. She is already enrolled as a graduate student in our program in Occupational Therapy and is called to bring healing and restoration as a therapist. Brittney is an passionate woman that was raised in the Assemblies of God. Brittney is often quiet as she enters new relationships, but that hasn’t kept her from inspiring a lot of women at UIndy. Her transparency makes people trust her, so they open up to her about the pains of their own life. And because Brittney has experienced many challenges herself, she has a lot to offer others that are trying to figure out their own heartache. A brilliant joy and pursuit of life seeps through the surface of every conversation she has. That is what has led Brittney to pursue a career in Mental Health Counseling. That career will allow her to pursue her call to those that are suffering depression, loneliness, suicidal thoughts, and self harm. Josia is another Pentecostal girl from small town Indiana. Though she comes from a pretty homogenous little town, Josia and her friend Kori completely embedded themselves with the international community at UIndy. She has as many Chinese friends on our campus as she does American ones. Josia has also been our resident artist. She thinks about art and creativity in all that she does. The integration of her faith and her work as an artist persists even when the Christian community has so often failed to understand that her creativity doesn’t all need to be images of crosses and prayer hands (she paints and draws those as well!). Josia is called to work as an artist and desires to connect that creativity to the work of the church. Kailey is United Methodist with an evangelical spirituality. She pursues every calling – school, singing, marriage – with an immeasurable drive and determination. Kailey was a highly competitive gymnast with plans to compete in college when she injured herself late in her high school career. The attitude and drive for perfection that were formed in hours long practices, repeating the same move over and over again to perfect it, now leads her to academic excellence, persistence in relationships, and a disciplined spiritual life. 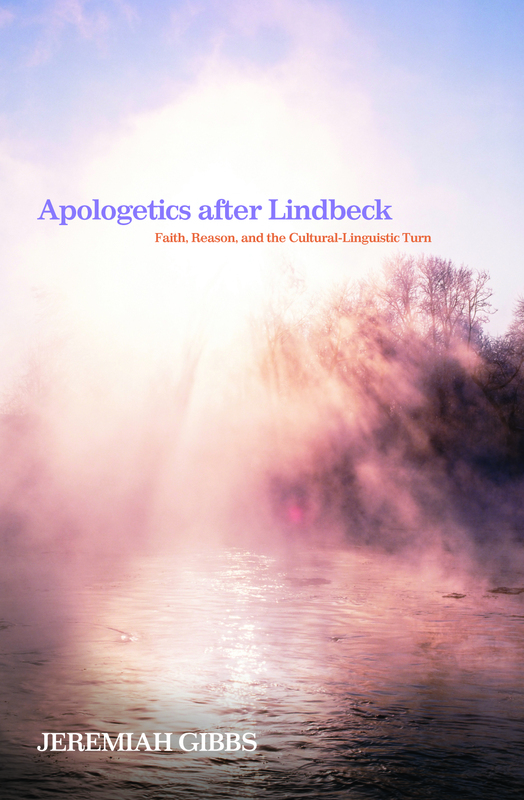 It was an honor for me to introduce this evangelical spirit to the contemplative practices of labyrinth and Anglican prayer beads, which have been a means of grace for her. In part because of the great care she received while recovering from her gymnastics injuries, Kailey is pursuing her Doctorate of Physical Therapy. Kori and Josia (above) have absolutely led our entire campus in their commitment to crossing invisible boundaries with our international students. Kori has allowed these students to teach her about herself, her culture, and her faith. Hours spent with Chinese students have led Kori to hope to one day move to China for an extended period of missions work and service. As a self-proclaimed “Jesus Freak,” Kori is passionate about her walk with Christ and her mission to others. And if the Jesus Freak reference was not enough, few 22 year old students know as much mid-90’s contemporary Christian music as Kori. If I need prayer for a miracle, Kori is the one that I want praying for me. Jenn is an institutionally minded young adult in a time when most are filled with an unrepentant apologetic for individualism. 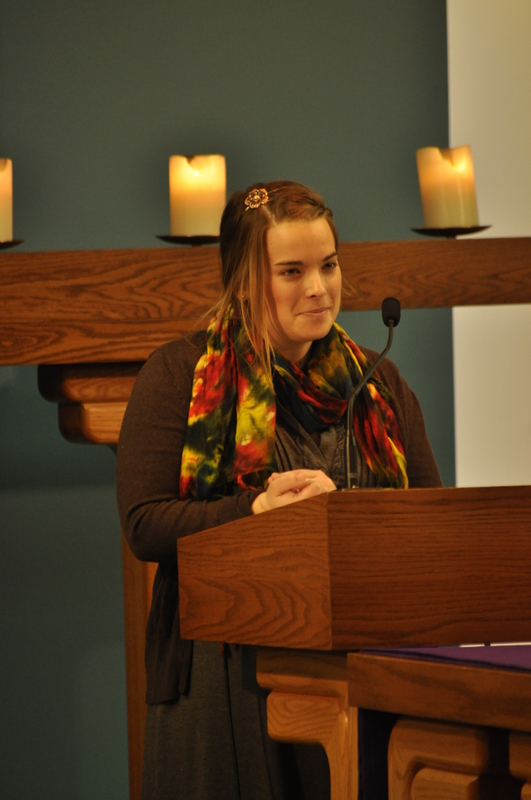 Jenn is as committed to the United Methodist Church as any student in our ministry. She served our office as a chapel steward student leader and later as the office’s intern. She has served as the president of the United Methodist Student Association and was one of this year’s recipients of the Leila Anderson Award for Christian service. She believes in and desires to serve the United Methodist Church even while having a clear view of the flaws. She is pursuing a M.Div. next year at Garrett-Evangelical Theological Seminary and hopes to use her skills as a public relations professional to advance the mission of the Church. Amanda is the kind of student that thinks of every interaction as an opportunity to witness to Christ’s love. Rarely do students see their faculty and the chaplains as persons that need to receive ministry. But her service to these unlikely candidates is just an example of all the ways she is working to minister. Amanda was one of the students that helped found our campus’s anti-human trafficking organization and has been a significant voice for justice on our campus. She and just a small group of students have turned the tide on our campus such that Christians are the leaders of the voice for justice. Amanda was formed in a very faithful United Methodist Church and is now engaged to a Roman Catholic man. Unlike some that ignore that this difference matters, she and her fiance have taken this difference as an aspect of God’s call on their lives. She plans to live out calling as a communications professional and her ability to enter deep relationship affirm that calling. For the last four years I have watched Taylor pour herself into her friends with grace and humility. She is always present with the people around her. She has a unique way of depending on her friends without becoming dependent upon them. Because of the justice work being done by Amanda (above) and others, Taylor has heard a call to extend her gift of friendship toward those that are victims of human trafficking. Whether she chooses to pursue that calling as a social worker, counselor, or advocate makes little difference. The true gift that she will offer is an opportunity to have true friendship exemplified. Joe, more than most of my other students, is more like a colleague than a mentee. He has been a professional youth minister since he was barely old enough to be out of youth ministry himself. A number of life circumstances meant that Joe returned to school already having a strong sense of calling and a serious intellectual formation, as well as having established himself as a gifted youth minister. As he grows more confident in his theological voice, Joe has learned to speak truthfully and humbly about God and the Church. Though He loves youth ministry, Joe has heard God’s call to pursue ordained ministry in the United Methodist Church and plans to submit his life to pastoral ministry. He hopes to start seminary in the fall of 2015. I would be honored to call him my pastor if the occasion ever arises. 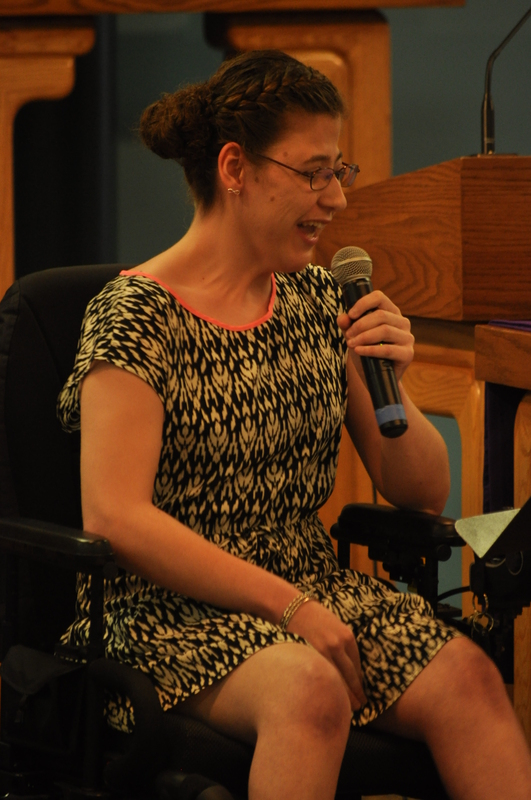 Deanne’s family and her United Methodist Church have invested deeply in this young woman. The result has been one of the most mature and committed Christians you will ever meet. Because Deanne opens up slowly, you may find as I did that you will be taken by her writing before she opens up in conversation. 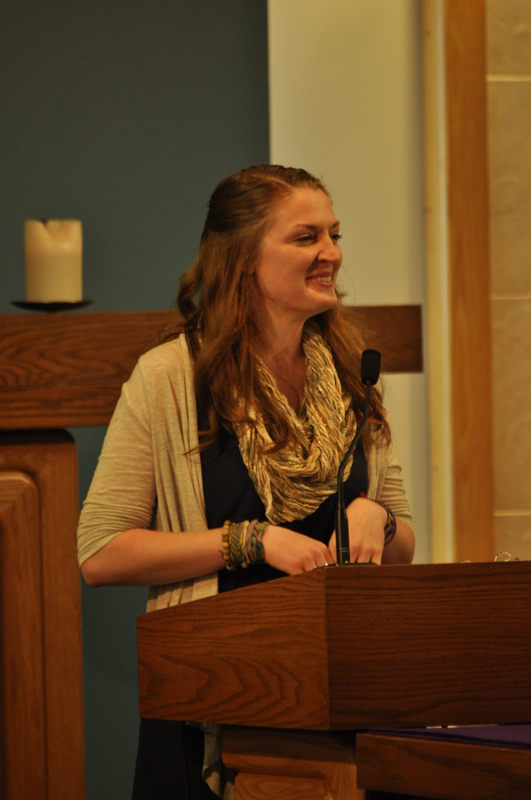 She is witty, intelligent, and has a compassionate and theologically astute vision of those around her. She simply sees the world differently. She invests deeply in relationships and has such emotional health that she is rarely the one to introduce conflict and tension. Any church or organization would benefit from her as a wise sage. If your church needs such a deeply formed leader, you may just be able to convince her to come work for you. She is such an excellent student that she started her M.B.A. during her senior year and will finish it next year. She feels called to nonprofit management; so some church out there may be able to sweep her off of her feet. Jordan came to UIndy to pursue her Master’s in Occupational Therapy, but through a long process of discernment and prayer has realized that God’s call on her life wasn’t to this career only but to those with down syndrome and other developmental delays. She may still become an Occupational Therapist, but she knows for certain that she will serve these kids in need. The size of her heart is obvious because she wears it on her sleeve. She responds to trust and transparency with a double dose of the same. She and Kailey (above) were raised in the same evangelical United Methodist Church and her spirituality is made up of the best kind taught by John Wesley: equal parts love of God and love of neighbor. Ashley is as empathetic and compassionate as she is brilliant. She carries herself into new and challenging situations with an emotional and relational maturity of a 40 year old. She so lives her humility that every compliment seems to surprise her. I’ve told her many times that her combination of intelligence, persistence, and relational ability means that she could quite literally be successful at anything she chose to spend her life doing. For those that she will serve some day, it is pretty spectacular that she has chosen to become a counselor. Ashley is a committed United Methodist that is leaving college with a spiritual and theological formation that has grown exponentially while at UIndy. I commend each of these young adults to all that they encounter. When you meet these young people, you are meeting the face of Christ.